If you want to raise your game and build an organization filled with people who will change everything, the first thing to look for is someone who hasn’t been brainwashed into believing that they’re not capable of great work. I’ve worked with both the categorized, commanded and dominated and with those who believe they are capable of great work. I’ve found both groups easy to understand and interact with while driving change. The group that seems to give me the most trouble are those who’ve seen others doing great work, want to do great work themselves, but struggle with the journey to a place of confidence. They’ll stick their hands up and volunteer for an exciting project, then linger along the edges of the meeting room, not wanting to push to the front too quickly. They’ll wait weeks to ask a question, I’m assuming for fear of looking foolish for needing to ask. I think they look foolish for wasting weeks on needless worry; so I tell them not to wait next time and nothing they ask is foolish. To all of you reading this who are in that journeying middle–and really this goes out to anyone reading this blog–read Linchpin by Seth Godin. Learn about art, the resistance and why you have an unprecedented opportunity to bring all of yourself to your work, to live your art and to be magnificent. You can do great work. You will do great work. Don’t expect less of people. Expect more. Stop keeping Mike pigeonholed as the guy who peed his pants in first grade or Suzie labeled as the perpetual teacher’s pet. Quit dwelling on that time Danny missed his deadline or all those times last year when Wanda couldn’t decide in time to seize huge opportunities. For the high school football team who’s never been state champions; teach them a drill they can run to perfection, improving their game and their confidence. Maybe they’ll win. For the work group that’s never met a deadline; implement a work flow process that frees the group from bad behaviors and helps them ship on time. Maybe they’ll meet their deadlines. For the managers that never seem to decide in time; create a meeting dedicated to making the decision and make clear the potential consequences of not deciding: loss of future business, or credibility, or something else that matters to them. Maybe they’ll decide. Today, I got into a disagreement over a blog post. In the blog post, the author offers one way to move the people of an organization from stopped-and-waiting toward innovating-and-creating. My response to the blog post was swift: That won’t work. That: The actions (and cautions) the author prescribes. Won’t work: Will not produce the capacity for independent innovation within the employees. Sure, the manager will happily hold a meeting, define the conditions and maybe get some actionable solutions. Yet, the goal of the actions prescribed isn’t to produce action at the moment, but the capacity for action in the future. Now, why am I reacting so viscerally to what should be a harmless, one-of-many options blog post about generating a new culture? Because too many of the options offered up in blog and magazine articles read like useful directions yet fail to produce the actual outcomes they claim to achieve. My emotional response comes from my frustration watching well-meaning people squander their often limited energies on action that create the desired outcome less than 2 in 10 times. With all the blogs out there (this one included) trying to help you create positive change, I bet you need some way to split the good advice from the bad directions, and test the effectiveness before taking any action. In my own, fully experimental, non-research supported method, I’ve found two ways to judge someone’s capacity for speed (of change). 1. Listen for their verbal clues. What do they say when presented with something much better, faster, cheaper than they thought possible? How did you do that? How can I do that? Complain about the speed with which you made the change (usually without a reason for why the speed is bad). Encourage you not to share your success with others (and provide an elaborate reason why). Complain about the age, experience, fill-in-the blank of you or the person achieving the change (ignoring the change itself). Ask you who told you to do that (this is the worst when it’s your boss asking you the question). Ignore the outcome entirely (as though you passed so fast before their eyes they didn’t even see you as a blur). 2. Watch for the behavioral clues. What do they do when presented with something much better, faster, cheaper than they thought possible? Pull the person close and ask for more. Create opportunities for their people to achieve the same success. Gather others together to see the success for themselves. Defend you from others who are trying to crush you or your success. Turn away when you talk about the success. Lean in to the discussions of the negatives or downfalls of going faster. Nod when others undermine the success. Act to isolate you or the success. Most people don’t always lean into change or always pull back , but you don’t want to know what they always do. You want to know what they’re doing today. How fast can Suzie or Julie, Danny or Jay go? Is she, or is he, leaning into or pulling back from this change (or from all change)? Sometimes knowing the answer to “How fast can you go?” of those around you is enough to keep you moving, if only because the knowledge points you in the opposite direction of the change-killers. Keep driving. You’re doing a great job! 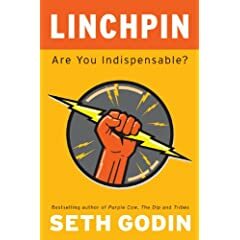 Seth Godin launched his new book Linchpin this week. I think I’ll be buying it this weekend. Wondering why I’m in such a rush? Check out these excerpts from the Amazon.com write up. There used to be two teams in every workplace: management and labor. Now there’s a third team, the linchpins. These people invent, lead (regardless of title), connect others, make things happen, and create order out of chaos. They figure out what to do when there’s no rule book. They delight and challenge their customers and peers. They love their work, pour their best selves into it, and turn each day into a kind of art. Plus, Steve Holt, an Engine for Change follower and fast friend of mine, is featured in this image inside the front cover. Congratulations Steve for being a Linchpin.